We had one goal when we started developing our hemp oil -- make a great, affordable product that delivers consistent results. We not only delivered, but far surpassed expectations, and we think you'll agree! Every bottle contains a whopping 1000mg of hemp oil! That's four times the amount that most companies use! We decided to up the dose because low-dose hemp isn't for everyone. High dose extract has a couple potential benefits, depending on your situation . Hemp oil supports relaxation and can really help you unwind at the end of a long day. The Omega 3 & 6 fatty acids contribute to heart heath, and the vitamin E is great for your hair, skin, and nails! You'll get a 1 fl oz bottle that contains a 30 day supply of the finest hemp oil on the market. All you have to do is fill the dropper up ¾ of the way with our peppermint flavored oil, squeeze it out under your tongue, let it sit for a minute, and swallow. It's that easy! Rest easy knowing that our product is made in the United States. We work closely with FDA approved facilities to ensure that every bottle shipped out has the best quality and consistency imaginable. 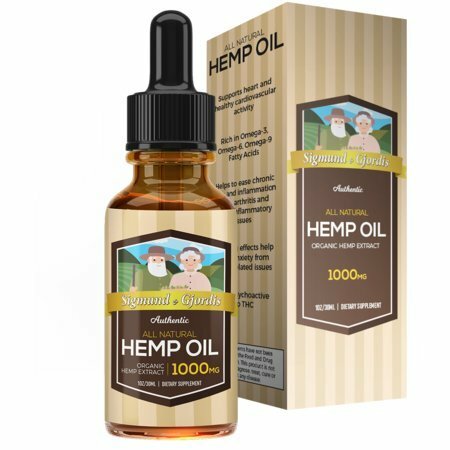 Heart Healthy - Hemp oil is known for being a heart-healthy product. It contains omega 3 & 6 fatty acids -- an important component for those who care about their cardiovascular health. POWERFUL Blend - Most hemp extracts contain 250mg of hemp in the oil, ours contains 1000mg! 30 Day Supply - Stock up with ease. Every bottle contains a 30 day supply. You can get between 1-2 servings a day, depending on your needs. As always, we only make and bottle our products here in the USA. We are PROUD to create an excellent product suited for a wide range of issues. If you have any questions about this product by Sigmund & Djordis, contact us by completing and submitting the form below. If you are looking for a specif part number, please include it with your message.